Our Heritage Room at the Visitor Centre is located in the centre of the island, between the prison and Le Manoir. The two classrooms of the 1841 Girls’ School now house the Tourism Office and La Société Sercquaise. Following conversion of our half of this fine granite building by members, we opened to the public in April 2005. The Room is open on two or three days a week during the summer season and whenever members can supervise it (see opening hours). At other seasons it is a good idea to contact the Secretary or a Section Leader in advance of your visit. Admission is free but donations are very welcome. 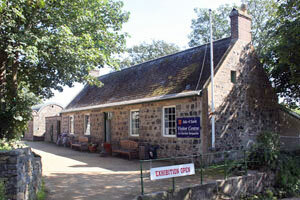 Everyone interested in Sark’s history and natural history is welcome - to view our exhibitions, displays and collections, and to spend time reading or doing research. You will be asked to sign the Visitors’ Book. A duty member will try to help you find what interests you. Library books and materials may not be borrowed. Our wireless internet allows visitors use their own laptops. There is a botanical microscope. Most items can be photographed with permission.